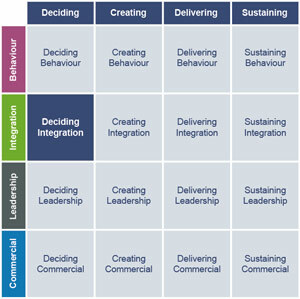 This page explains the 'Deciding integration' cell of the Alliancing Code of Practice grid. This grid helps to understand who needs to do what, at what stage, for a successful infrastructure alliance. The proposed delivery organisation is highly integrated, recognising that in an alliance model the client team are part of the execution plan or project - not that the project is being transferred to a third party. ‘Best for project’ selection principles have been established, providing a clear approach of how teams will be brought together from across the Alliance. The environmental enablers for collaboration, such as co-location and collaborative systems, have been identified and are covered in an implementation plan. The following case study provide a detailed look at how organisations have used alliances and the lessons that have been learnt.